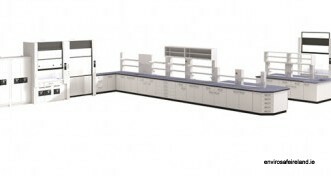 Envirosafe Ireland, in partnership with Koetterman, provide a range of Laboratory Furniture. Whether you are looking for a complete laboratory or individual items of furniture to retro-fit your laboratory, Envirosafe Ireland supply the best built, modular laboratory furniture for your requirements. Made of solid, durable steel, all products guarantee maximum flexibility and enable you to work efficiently without the risk of clutter or wasted space. Envirosafe Ireland supply a range of laboratory furniture is manufactured from steel, a material that can be 100% recycled. This protects the environment even further because it is designed for durability and longevity.